Take a spin with Slots.lv! Slots.lv is the sister site to Bovada. The key difference between the two is Slots.lv focuses solely on casino games while Bovada is heavily involved in sports betting and also offers online poker. Slots.lv only provides games to Canada and US States that do not have legislation specifically for online gambling. 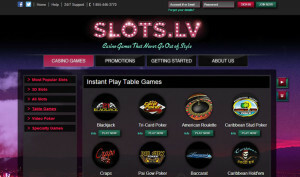 In this review of Slots.lv you can first find a quick overview of the company. Then the Craps game is covered looking at the software and value that can be found. Bonus offers are covered next to see if they affect Craps players before looking at the other games available. To wrap up you can check out the site’s banking options and customer support. Being part of the Bodog group, the people behind Slots.lv have a long and respected history in online gaming. Like the rest of the group, Slots.lv is licensed by the Kahnawake Gaming Commission and operates out of the Caribbean island of Antigua. The site launched in 2013 and uses both Real Time Gaming and BetSoft software. While Betsoft provide state of the art 3D slots, RTG has one of the most popular US facing casino packages, including many favorite table games including Craps. Slots.lv casino can either be downloaded onto a Windows PC or played on your browser using their Instant Play casino. The standard rules Craps game is available on both with very slight differences – and to be honest I think the Instant Play version plays a little smoother. The look of the table is great and the design makes it easy to navigate. You can hover over different areas which then highlight to show if you can place a bet or not and a tag appears showing your maximum bet there and the payoff you get. Table limits go up to $1000 and individual bets are capped at $100. Bets can be increased by clicking on the chips laid at the bottom of the screen and removed by clicking on the stack or using the “remove” button. After the initial come out roll has progressed into the point round you can bet 3x odds on your pass line bet. Points are paid out at 3:2 for 5 or 9, 7:6 for 6 or 8 and 2:1 for 4 or 10. All this brings a combined house edge of 0.61% on pass line bets and 0.46% on don’t pass bets. Many other bets which excite the casual gambler yet hold little long term value, are clearly marked on the table, or can be found out by hovering above the betting area. The site does provide a sign up bonus with a 100% match up to $500. This requires play-though of 40x the deposit and bonus amount before the funds can be withdrawn. Unfortunately Craps games are not eligible for this bonus, and any games played will not count toward clearance. Craps players can get their hands on a free $10 by liking the Slots’ Facebook page which needs 50x play-through, or you can just benefit from the loyalty program, the Slots Club with awards players a point per $3 wager on the Craps table, which can be exchanged back into dollars for every 777 points cleared. While this is may not be the most generous, it is at least something. While there are many games on the Instant play client you can find Slots.lv full range on the downloadable version. This includes some amazing slot games, video poker and favorites such as Blackjack and Casino Poker games. Many of these games also feature progressive jackpots to add to the fun with a chance of a big win. Concentrating on the North America market means Slots.lv banking options are somewhat limited. There are four options in total: Amex, Bitcoin, MasterCard, and Visa. While Slots.lv is relatively new, Bodog and Bovada both gained solid reputations for processing quick withdrawals. The pay-out methods listed under the site’s Help page contain a lot of information of different ways to cash-out including limits and charges. The easiest it appears for most sites and customers would be the couriered check which is distributed free of charge once a month and arrives within 5-7 days. They can hold value up to $3000. For help with this or anything else Slots.lv customer support are available 24/7 via email or a toll free US telephone number. Slots.lv appears to want to provide the same customer care and focus that Bodog and Bovada have built their reputations on. The site is using two of the best software packages available to US facing casinos and has collected a great selection of games. The RTG Craps game used by Slots.lv provides a great looking and playable interface and players can even get a little bit of extra value from the sites through their Loyalty Programs and social media giveaways.